This is an open XMPP server for KDE users and contributors. Anyone with an XMPP client such as Kopete or KTp can join it. XMPP (formerly named Jabber) is an open decentralised instant messaging network. Unlike usual proprietary systems like MSN or ICQ, there is not a central server owned by a company, but a lot of different interconnected servers. KDETalk.net is one of them. 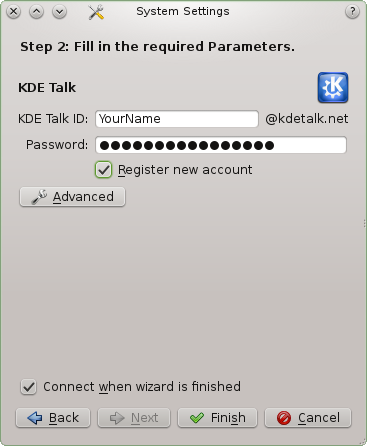 You can register a kdetalk.net address with any XMPP client. 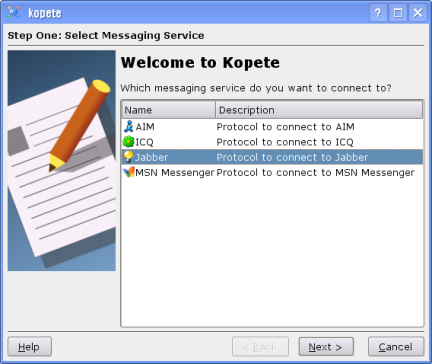 Below are instructions how to register with Kopete the official KDE instant messenger client and KTp (KDE Telepathy), KDE's next generation instant messenger. If you are using Microsoft Windows, you can use Psi which is a Qt based client which shares some code with Kopete. 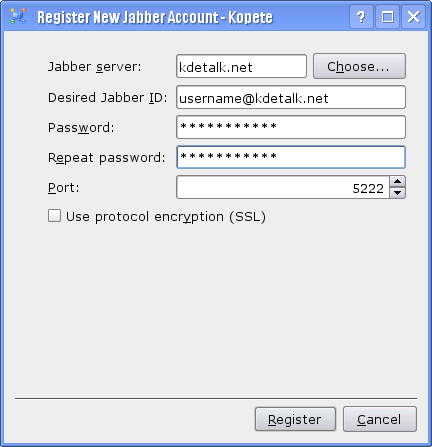 If you are a contributor of the KDE project, you may file a ticket to obtain the Jabber ID which match with your @kde.org address. Choose a password and select "Register new account". You can let the advanced settings untouched. Once you have completed this page, click Finish. If the username is already taken, try again with another. Open the Kopete configuration window. (the Configure entry in the settings menu). Click on the Register New Account button. A new dialog appears. Choose a password, and enter it twice. You can let other fields untouched. Once you have completed this page, click Register. If the username is already taken, try again with another. If you encounter problems, or simply have questions, you can send a mail to sysadmin@kde.org. Maintained by KDE Sysadmin. Design by KDE Web Team.